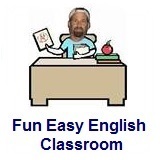 ﻿ Fun Easy English - new classroom free online classes english language lessons speaking listening writing reading january 14. 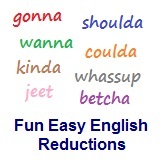 Today in the Fun Easy English classroom you are going to learn "whassup" an American English reduction. This is an old Budweiser beer commercial (advertisement) with the English language reduction "whassup" used about a bazillion times. lol. Use a dictionary to look up words you do not understand. This is pretty much the same commercial with the same guys 8 years later. Pretty funny. Use a dictionary to look up words you do not understand. Budweiser Original Whassup Commercial With Old Women - This is pretty much the same commercial with old women. Very cute. Use a dictionary to look up words you do not understand. 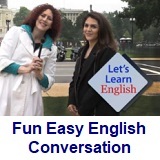 Conversation Lesson 14 - How About This? In this lesson Anna is going to the theater with her friends. She does not know what to wear. She looks in a magazine to get help and gets a surprise. Anna: Hi, there! In Washington, D.C. people do many things in the evening. They go listen to music. They eat at a restaurant. They go to the theater. Anna: Tonight I am going to the theater with my friends. But I don’t know what clothes to wear. Maybe this magazine can help. Anna: Her clothes are beautiful! I really want a friend like her to help me. Genie: I am Genie! You want help. I am here to help you find the right clothes! Anna: Awesome! How about jeans and a t-shirt? Genie: No! Jeans and a t-shirt are too casual. How about something more formal? Anna: Wow! Genie, this dress is beautiful. But it’s not the right size. It’s too small. Genie: Yes, it is too small. But green looks great on you. Genie: Take off the green dress. Let’s try a green shirt and a skirt. Anna: Oh, Genie! This green shirt is too large and this orange skirt is too orange. Genie: Yes, the right size for you is medium. Let’s try again. Anna: Oh, I don’t like this outfit. Genie: No. That does not match. Anna: These clothes are formal: a suit jacket, a dress shirt and a tie! They look great! Genie: Those clothes look great … for a man! Something is wrong. Genie: Oh. Thanks! Now these clothes look great on you! Anna: They do! Um, Genie, can you put on a gold belt? Anna: Can you put on a jacket? Anna: I love the jacket! How about a hat? Genie: Mm, take off the hat. That’s better. Anna: Genie, these clothes look and feel great! Let’s go to the theater! Genie: Sorry, Anna. I have to help other friends. Go to the magazine if you want me to help again. Anna: Thanks, Genie. Sure thing. Goodbye! Anna: There are many places in DC to go for a great evening out! And it’s nice to have a friend to help me look my best. Until next time! Bye! In this video, learn to say the new words. Learn two ways to make a suggestion. In this video, you ​learn about describing clothing with color words. magazine - n. a type of thin book with a paper cover that contains stories, essays, pictures, etc. What do you like to wear to go out in the evening? What are you wearing today? Write ​about your clothes and their colors and sizes in the Facebook Comments section below. Then practice with a friend. Click lesson activity to get the printable PDF version. The page opens to a new window.